Embellish your labels to give your products more 'shelf shout' and make them stand out from the competition. Hot foiling gives a premium look to your product and is used typically in the wine and spirit industry / luxurious product marketplace to enhance the overall look of the printed product. 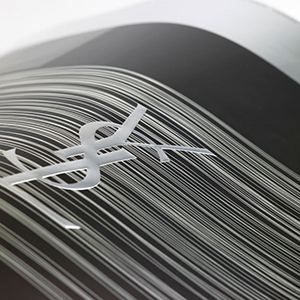 Embossing raises the surface of a particular element of your print giving stand-out presence on the shelf. It also has a tactile effect which grabs the attention of the end user and encourages them to linger over the product. Irregular shaped print lends a special identity to a product differentiating it from competitors products on the shelf. Application of an all–over UV varnish gives extra protection to the print. It helps avoid scuffing and general abrasion during packaging, transport and handling. Gloss, Satin or Matt coatings and varnishes are available for paper, plastic and foil. Varnishing a particular area or element of your product can add an interesting dimension to the print and highlight an area – whether using a gloss on certain parts of an overall matt label or vice versa, this is one of the least expensive forms of print embellishment, yet adds a real touch of class. An overall varnish is applied, when this varnish comes into contact with the skin, or is “rubbed” it releases a fragranced aroma (e.g. fruit, flowers, chocolate, perfume etc.). Possible uses include promoting perfumes, promotional give-a-ways, packaging for scented products and scented stickers. Latex Inks: Areas of the printed product are coated with an opaque latex (often silver or gold) to create 'scratch panels' which can be scratched off to reveal hidden information underneath.Typically used on Scratch Cards. Tactile Inks, coatings and varnishes: Elements of the design are raised, often used to produce a tactile warning symbol to warn blind and partially sighted people that they are handling a dangerous product. Colour Effects: Includes pearlescent, interference, fluorescent and phosphorescent inks (glow in the dark). Metallic Inks: Full colour metallic effects can also be achieved using a combination of process inks and special substrates. Particle Effects: Includes pearlescent and holographic inks. Photochromic Inks: When printed with light sensitive inks graphic elements can only be seen under a UV lamp, often used to prevent fraud (e.g. on Tax Stamps). Thermochromic Inks: Temperature sensitive effects such as graphic elements that disappear as a product is chilled and re-appear as it reaches room temperature, or warnings that will only appear if a product becomes too hot. Light-Resistant Inks: For longevity and demanding environments.